Internet has become so common such that not even a single day passes without using some sort of its services like mails, chatting, blogging, social networking, etc. But have you ever thought about the tool you use to surf the internet - "THE BROWSER". Do you know how it works or what it is based on? How much secure a browser is? Is the browser you are using is better than others? What all you can do with it? We never care for such things as long as we are able to surf the internet using the old crap installed in most of the operating systems. From the above pictures we get that Chrome, Safari and Opera have 100/100 but it is not that all are of same standard. It just implies that all the browsers have passes all tests in Acid3. Chrome out lasts every other browser in terms of speed and captures the 'Numero uno' spot. 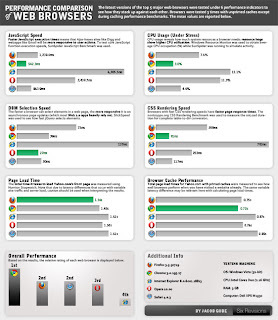 Also I would like to add a detailed performance report on popular browsers where Google Chrome is the clear winner. Click the image to see a large preview of the scores and comparison. Along with performance there are lot of other factors which influences people to use various browsers such as add-ons, themes, plug-ins, etc. The race is on and every competitor is trying to become better over the other. In the end we the end user is benefited by these as our browsing experience increase day by day :) . Enjoy surfing the internet.